Opening Saturday 14th of August at 5 pm. Is there an Icelandic word to express Clarity? In The Lives of a Cell, looking at the earth from above (...) it has the organized, self-contained look of a live creature, full of information, marvelously skilled in handling the sun. Take a look through the microscope. devoted to our personal beliefs. by commitment to materialize this devotion. propose the shape of the matter. The way the world happens to look. Zooming in on the illusion of these separate identities. Embrace the chaos in the dirty earth. permeating out of this cosmos into the next. Only a limited perspective can show things out of place. Human being is part of pollution. making up for its own mistakes. 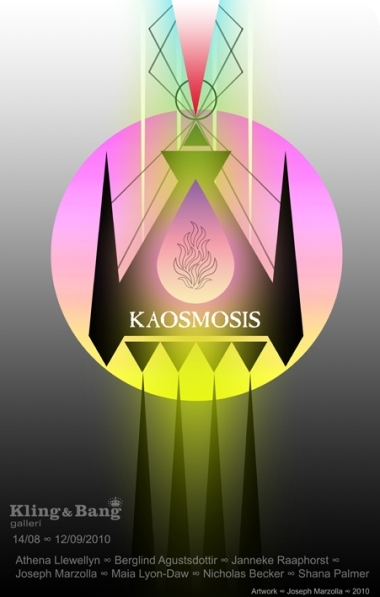 Kaosmosis – a group show at Kling and Bang August 14 – September 12. With a performance opening August 14 at 5pm. Life springs eternal from the source. Chaos activates serendipitous cohesion. Form coagulates and dissolves fine-tuning and balancing towards sustainability. A fluid stream spills into consciousness and life rejoins, molds and regenerates. To commune, transfer, merge, synthesize and evaporate; the infinite urge of procreation moans a spiraling eroticism inextinguishable and divine.